Exciting, space saving alternative to traditional Roulette! 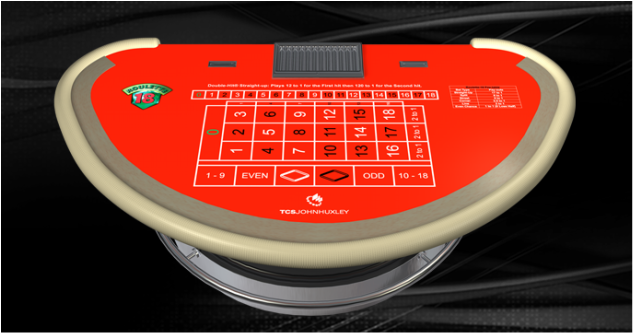 Roulette-18® uses a 20-sided die instead of a wheel and a unique table layout that does not require a roulette-sized table. The objective of this space-saving game is simple. Players place their bets on the Roulette-18 layout – which is similar to a Roulette layout, but smaller. A 20-sided die numbered (1-18, plus a ‘0’ and a ‘00’) is rolled in a shaker before being exposed. According to the bets placed and the number rolled, the Dealer then pays winning bets. Like traditional Roulette, players can place straight-up, split, street, corner, line or even-change bets. In this game, the double zero is ignored. 1. Players place their bets on the Roulette-18 layout, just as they would in ordinary Roulette. 2. A Roulette-die is rolled in a shaker and then exposed. If the roll is a double-zero (00) all bets remain in action and the die is rolled again until a non-00 winning number is determined. 3. The Dealer collects all losing bets and pays winning bets according to the pay table. For added excitement, casino operators may choose to include the Double-Hit betting section on their Roulette-18 layout. The Double-Hit straight-up bet is a proposition bet based on two consecutive rolls of the dice.